Dodd Raissnia, the distinguished-looking co-owner of Peace Industry. If you're ever in Hayes Valley, I'd recommend checking out this shop to see some gorgeous felt-wool rugs. I had a lovely time in San Francisco - many thanks to David Silver's Media Literacy class at USF for inviting me to speak! I love the green in the rug behind him. Jasmine, thanks coming to talk. I really enjoyed your presentation. You seemed very down to earth and it was refreshing to hear that even long-time bloggers still get butterflies once in awhile! those rugs are so gorgeous. i'm drooling. no La Femme, that rug's mine! 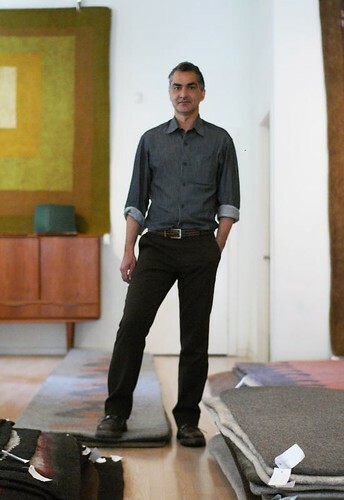 after reading this post, i scurried off to hayes valley to see the rugs in person. i spoke with dodd, sharing with him the pike/pine invitation. and then i found myself impulse-buying a lovely rug... hooray! Hi sarah - Wow, congrats! I'm absolutely in love w/ all their rugs & thrilled you liked them too. Hi kathleen - I'm glad you enjoyed the presentation. It was a lot of fun for me too.